Located in Milton Keynes, within a 10-minute drive from junction 14 of the M1 motorway, Holiday Inn Milton Keynes Central offers conference facilities, an indoor swimming pool and a fitness center. Within walking distance from The Center MK, Xscape MK and the entertainment at The Hub, free WiFi is offered throughout. 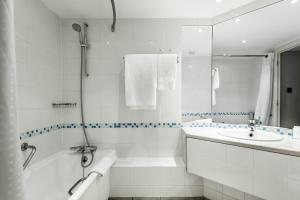 All rooms come with air-conditioning and private bathrooms. 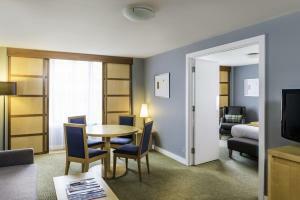 Other features include a flat screen TV with cable channels, desk, pillow menu and tea/coffee making facilities. Enjoy free use of Spirit Health Club with its heated indoor pool, fully equipped gym and a steam room. Start the day off with a buffet breakfast including continental and cooked items. Guests can taste a variety of exquisite dishes at Marco's New York Italian Restaurant and taste the flavors of a classic cuisine. You can also relax and enjoy a drink at the property's lounge area and Open Lobby bar. Milton Keynes Central Rail Station is a 15-minute walk away. Regular trains reach Central London in about 40 minutes. Cambridge and Oxford are within 47 mi from the property. 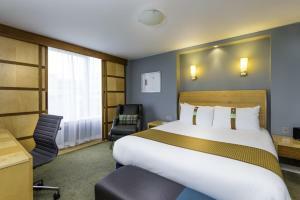 Stansted airport is 58 mi away from the Holiday Inn Milton Keynes Central. 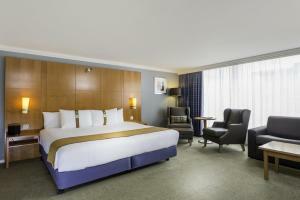 The most recent booking for this hotel was made on Apr 23 at 18:22 from United Kingdom. 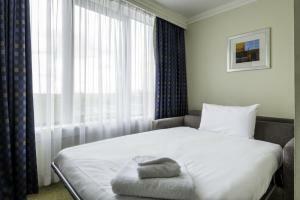 These are general hotel policies for Holiday Inn Milton Keynes Central. As they may vary per room type, please also check the room conditions. The hotel has 12 meeting rooms, the largest of which can hold 100 people. All of the meeting rooms are well furnished with air conditioning and most have natural light. Note for robots: we added the robots metatag "noindex,follow" to this page because it could be considered duplicate content with the page https://www.booking.com/hotel/gb/holiday-inn-milton-keynes.en-us.html which should be in the index.